Outlining the issue of participation, panellist Alina Saba, a Mugal indigenous woman, said: “People on the front lines of climate change don’t have access to resources and don’t have a voice”. 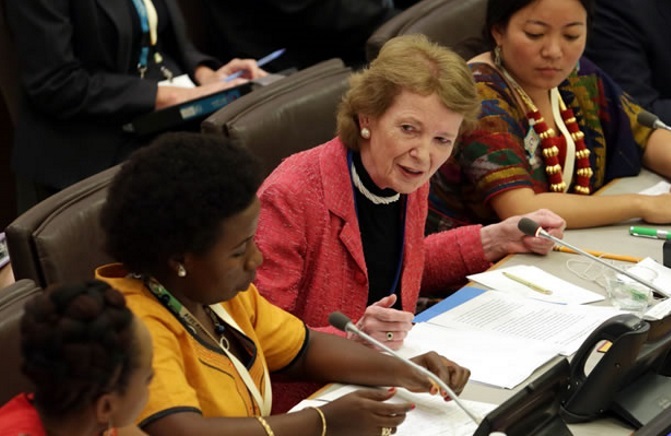 Leadership was a key message emerging from the Leaders’ Forum and Mary Robinson told the session that “we need political leadership and a long term vision at all levels”. “Voices from the Frontlines” was one of four thematic sessions held during the UN Climate Summit 2014. Other speakers on the panel included Evo Morales, President of Bolivia, Enele Sopoaga, Prime Minister of Tuvalu and Ronan Farrow.